Today's video is a quick video on how I store and organize my ink pads. Another great solution if you can find one at a local Salvation Army is using a cassette holder. I'm told they work wonderfully as well. This is a super great idea. I never thought of using old cassette holders. I have 3 of them in my closet. Thank you for helping me organize them. I have them in a bin right now and it's so hard to get to them. This is wonderful! I enjoy your blog and your videos. Thanks for all the great ideas. 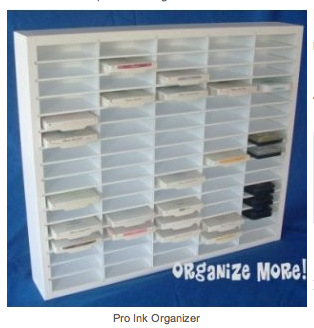 Did you know that Tim Holtz says that you do not need to store Distress Inks upside down? Something about their formula. Love your videos Christina and I have been "following" from your first video! lol Tim Holtz says that none of the ink pads have to be stored upside down because ink is a suspended median and when reinking an ink pad you should take an old credit card or something like and "work" the ink into the pad. He says that people don't do that and that's why they have to reink so much. Who Knew?!! We have been taught for so long to store them upside down.